Great for kids who are not sure what they want for Christmas, this letter from Santa serves as an IOU for a later gift. I want to get you something very special this year, but I didn't know what you would want the most. 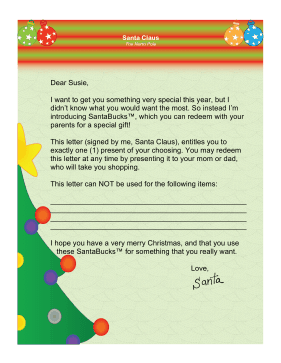 So instead I'm introducing SantaBucks™, which you can redeem with your parents for a special gift! This letter (signed by me, Santa Claus), entitles you to exactly one (1) present of your choosing. You may redeem this letter at any time by presenting it to your mom or dad, who will take you shopping. I hope you have a very merry Christmas, and that you use these SantaBucks™ for something that you really want.